I’ve heard a few discussions lately from parents worried about their children’s weight. Opinions ran from putting the kids “on a diet” — which I’ve already said is a bad idea for anyone — to the idea that even discussing weight with a child is a recipe for eating disorders. I can see both points of view, and have an opinion of my own, but I want to know what you think. Take a minute to answer the question below. Even if one of the answers is pretty close to perfect for you, please don’t hesitate to say more in a comment afterward. Do you worry about your child's weight? They're in better shape than I am. I want to teach them good habits while they're still young. Kids are supposed to have a little baby fat. I don't want them to be teased like I was. Yes I worry about my kids ages 5 and 7. They like eating processed carbs, like sugary cereals, bagels, rather than lean meats and veggies. Eating this way has made me overweight and constantly craving sweets. I don’t want them to be like me craving processed foods and never feeling fully satisfied when I eat. then don’t buy/make them…if they’re not there, they can’t eat them. Kids pick up their eating habits from their parents so not having them in the house is good for the parents and the kids. If there’s the occasional indulgence outside the home, that’s okay, but at least it won’t be all the time. No, I don’t worry about making my kids fat. I make sure to give them good, healthy meals every day with only crappy foods (aka McDonald’s) every once in a while. I also insist they do something physical every day, which isn’t that hard unless it’s the dead of winter. As a result, they’re actually underweight. Considering that the “average American” is overweight, that’s great news. Yes I worry about my kids getting fat, but that’s just Mom worries. Thankfully my girls both love various vegetables, but they also love french fries. They only get the junk once and a while so I’m not that worried about it. They eat what we eat and we don’t eat too horrid. But there is always a worry. No I dont worry. I wish my daughter (age 7) wasnt so picky. She will not go anywhere near meat which doesnt bother me but she can be a little difficult when I try to feed her green vegetables. I also limit the amount of junk I keep at home. Besides all that she is extremely active and I give her vitamins daily. Her pediatrician said she was healthy and on target with her height and weight and his opinion I trust. Nikie, what does she eat? If she doesn’t eat meat or green vegetables, all that leaves is … bread and pasta? You must be extremely ignorant if you think the only things to eat are meat, green vegetables, bread, and pasta. So there’s this literary technique called “hyperbole“. Maybe you’ve heard of it. Thanks for your wonderful contribution. Luckily before my son was born a) learned how diets actually make people fat and b) most importantly, discovered Weston Price. I imagine the teenage years will be tougher for him, but I believe it will always be part of his life. William, I suspect TV is involved, but it’s not because it replaced exercise. It’s because every hour in front of the TV brings you several ads for processed food that you just have to have right now. it most certainly is because they replace it with exercise. Kids stay indoors playing games and watching TV, and don’t play outside as much. That combined with the crap we are feeding our kids causes childhood obesity which is ABUSE! Lets not think about the psychological effect it has on them as they grow up.. but their arteries, lungs and hearts look like a 60 year olds. WE are doing this to our kids, and to say its NOT because of lack of exercise is wrong. Sorry Kaylee, but you are wrong. Study after study has confirmed that weight is almost entirely a result of what you eat. Yes, you will be more fit if you exercise than if you don’t, but someone who eats wrong can exercise all they want and they will still be overweight. And don’t respond saying I’m against exercise, or that I don’t think children should get more of it. I haven’t said that, because I don’t believe it. But obesity is almost entirely based on how we eat. I don’t think that AC is to blame for the obesity epidemic in America. However, the processed GMO foods and the lack of exercise are. If you read books about farmers and ranchers in the 1800’s, you will see that they worked (in planting and harvesting seasons) from sunup to sundown and ate more than any calorie-watching person could stand to see in one place. They even ate apple pie for breakfast! The only condition to eating this much was as soon as they were full, they would stop eating. Children were rebuked if “their eyes were bigger than their stomachs.” All of this food was homemade by the mom of the family, assisted by the sisters. There were no restaurants or factories cranking out plastic and silicon labeled as food. Greer, fitness and fatness are related, but not opposite ends of a spectrum. When I was in the Marines, one of the fittest people I knew was also overweight by at least 30 pounds. I’m not talking about a bodybuilder who was “over the standard” despite low body fat. He jiggled when he walked. And he really shook when he ran the semi-annual physical fitness test: 3 miles in under 19 minutes, 20 chin-ups, and 80 sit-ups in 2 minutes. Under all that fat, there was an incredibly fit person. Changing how he ate would have solved the fat problem, but no one knew how — or cared — to fix it. I have strong opinions on this. If every time a child cries we jam something in his/her mouth, we are reinforcing a behavior that will later cause him/her to feed themselves when times are tough. There’s nothing wrong in letting a baby or child cry for a bit. If you just fed a baby, he/she is not hungry unless they threw it up. So the baby is not crying because of hunger. The bottle/treats ARE a comforter, and WILL stop a baby/child from crying, but are teaching the child the wrong message. Deal with the distress, whether it’s a need to burp, a skinned knee, a rebuke from the boss, etc., instead of covering it up. That is our responsibility as parents, and for ourselves as well, as adults. See, I said strong opinions! So what do we do just let the baby starve? A baby is going to cry when its hungry. I agree with doing this method to a child but not a baby. A baby cries because its hungry, has a dirty diaper, wants attention etc. A child will eat if they are hungry but a baby?? they don’t know any different, all they know is that their stomachs hurt from not having any food/milk. Jean, I agree that no one should withhold food from an infant because they’re worried about the infant’s weight. I think Lauren was talking more about not always using food as the first response to crying. Like she said, if the baby just ate, they’re not hungry. It’s the same as getting a baby to sleep through the night. Yes, the baby wants to be picked up and comforted by mommy. But it’s better for the baby (and the mommy) to learn ways to comfort himself. to reply to DREW. you know nothing. Baby’s CANNOT sleep through the night. They need to be fed atleast every 4-5 hours. So if they are crying in the middle of the night then it is because they are hungry usually. Baby’s do need to learn to self-soothe, but not in the way you suggest. Kaylee, I don’t know what your issue is with me today, but you’ve managed to be both disagreeable and wrong twice in a row. … no one should withhold food from an infant because they’re worried about the infant’s weight. Okay, so I’m not saying to withhold food. What was I saying? … if the baby just ate, they’re not hungry. Okay, so if the baby just ate, then the crying is because something else is wrong. Like what Jean said (that I was replying to): “A baby cries because its hungry, has a dirty diaper, wants attention etc.” So if the baby is crying because it has a dirty diaper I should feed it? Umm … no. Some infants as young as 3 months old can snooze for six to eight hours at a stretch. By age 6 months, nighttime stretches of nine to 12 hours are possible. Most babies will start sleeping through the night somewhere between three months and six months. … a 6-month-old baby may sleep six hours at night before needing to eat. Yet, even though babies achieve this sleep maturity some time during the last half of the first year, many still wake up. The reason? Painful stimuli, such as colds and teething pain, become more frequent. Major developmental milestones, such as sitting, crawling, and walking, drive babies to “practice” their new developmental skills in their sleep. So in fact it is perfectly normal for babies to sleep through the night starting somewhere between 3 and 6 months of age, and when they don’t it’s not necessarily because they’re hungry. Now … next time you come into my digital living room and call me uninformed and a bad parent, you better bring a hell of a lot more than a pile of misinformation backed up by a bad attitude. I have 8 thin children – not an ounce of fat on any of them. I know a lot of it is great genetics (there dad is naturally thin and I was until I screwed up my metabolism by dieting). They for the most part were raised on crap until about 3 years ago when I became aware of the SAD diet we were all eating. I do have a couple rules – everyone goes outside every nice day year round for at least a little while. I don’t turn the A/C on until it is consistently in the 90’s AND no TV or computer or video games before 6pm. They also play sports some. I am sure it is a combination of all things because my big kids still eat lots of crap they buy themselves. I am teaching them things like “lard is your friend AND seriously only REAL butter will do!” I hope they take it with them into adulthood! My guys are both pretty thin, but fit. They love their meat, fruits & veggies, but I am trying to wean them off the carbs more lately. I am more concerned about them eating for long term health as opposed to worrying about them getting fat. It is always an uphill battle. Mary, I’ve heard so many horror stories about what schools feed kids. Some even tell parents what they can send in bag lunches they pack themselves. My 4 kids are all lean and in good shape. They all have a huge appetite for vegetables. I really think it is a question of not over-cooking the vegetables. My mother grew up on canned vegetables. She didn’t know she liked asparagus until she had it cooked my way. I worry about my kid’s weight. She won’t put any on! Lucky for me, I have easy access to an American diet to provide plenty of calories. Oddly enough, she (at 20 months) comes and asks me for jicama and apple when she can see the cookies sitting on the counter. PS. She loves your brownie recipe. Like many of the commenters, I don’t worry about it because we eat in moderation and stay active. My children are fit and healthy and we are NEVER at the doctor, unless it’s a trip to the E/R for my eight year old son! There are far worse things that I worry about when it comes to my children, their weight doesn’t even make the list. I worry in the sense that I know there are the genes for being overweight or obese — I was morbidly obese myself until a few years ago. However, I also don’t want to make her feel like I did as an overweight child; I was shamed and ridiculed, including by my own family and put on the Slim Fast diet at age 8, rather than taught healthy eating habits and given a good example of daily exercise. My daughter is a toddler but I give her a wide variety of healthy foods. I don’t believe in making any food “forbidden” so there are “sometimes foods” in my house, for sure. I don’t worry about my children’s weight. From earliest childhood, I have given them child-sized portions – something Americans have apparently forgotten. While their friends were scarfing down Big Macs with giant-sized fries and sodas, my kids were satisfied with a burger and a few fries. It’s all about the portion. Actually, my struggle with weight and obsession with food is part of the cause of my daughter being anorexic. So, I worry, but for a different reason than most people. She’s doing well right now but it’s always there. Scary stuff. So, be careful how much you obsess on food with and in front of your children. I’m too young to have children, but I worry about my younger sister. She’s almost a teenager (there’s a 7 year gap between us) and is overweight (not horribly so, but…). I know my mother is concerned, but she’s very wishy washy when it comes to actually taking action or changing rules and habits. My parents were more concerned with what I ate when I was little (though not how much) but when my sister was born we had a busier lifestyle and they got more lax. So she’s always had more junk food than I was allowed, and has spent more time on sedentary things like video games than I ever could. …just generally poor eating habits. I struggled with my weight a little in middle school but luckily I came into more health-conscious eating and exercise habits on my own as I got older. You’re never the bad guy. Always be supportive. Always tell her you love her. She hears, she just doesn’t wish to listen. There is a difference. Repetition is key! Positive influence through Action is also good. Offer to go for a walk with her! My children are 5, 3, and 5 months. I feel that I cook pretty healthily. I cook from scratch (not a lot of processed foods or instant foods), I try to include whole grains (I grind my own wheat, make my own bread and noodles), and I try to have more vegetables and fruits than meat. My biggest concern is that I seem to have this anxiety as a mother to make sure my children get enough food. You hear/see jokes about how moms are always pushing their kids to eat. I have tried to take the power struggle out of meal times. Instead of having a rule that you can’t have dessert if you don’t eat all your dinner, we decided to only have dessert on a certain night of the week and every one got it. We have rules that you don’t have to eat all your food but you do sit at the table until everyone is done and you have to eat what is on your plate before you can have seconds of something. I have breakfast, lunch and dinner and a small snack in between so that there is certain times for eating. I wanted to prevent a grazing attitude and a ‘I don’t know what else to do so I will get a snack’. I try to have lots of exposure and opportunities to try foods but not force them to eat it. I worry that I do not have a correct concept of portion size for my children. I started worrying about this when I realized my 5 year old could eat the same size hamburger as me. I don’t want to force them to eat (i.e. ‘You have to take two more bites before you leave the table’) but I am letting them eat as much as they want at mealtime. Should I be? I want my kids to be healthy and have a disciplined lifestyle but I want them to have a healthy relationship with food. I agree that putting a kids on a diet is wrong. And I never make comments like you are so skinny or you are so chubby to my children. But I also try really hard not to talk about myself that way. I grew up in a house that my mother was always saying how fat she was and trying the latest and greatest diet. I think this had a greater impact on my body image than what other kids said at school or what nutrition we may or may not have followed. I am very interested in a blog about child nutrition. Thank you. I don’t really worry because we eat a very healthy traditional foods type of diet and make junk a rarity. We’ve also chosen to avoid video games and are very active and involved in sports and dance. It’s my husband that I worry about. He has not gotten on board with the healthy eating. He’s very fit now, but I’m afraid the sodas and junk will catch up to him one day. At least he has finally admitted recently that the way I feed our kids has definitely paid off in their overall health. He can’t ignore the fact that they almost never get sick and haven’t been to the doctor in years! Family members who won’t get on board is really frustrating. I’m working on persuasion techniques and will share them as I come up with them. Atari? The old kind with the square joysticks? My hands hurt just thinking about holding one of those things for hours at a time. I haven’t had TV in my home for almost 20yrs. Hooray! Because of this, we do not see the commercials for the junk food that inundate our society. In the past year we have added netflix to our home. This is monitered very closely and only allowed on rainy days and maybe at night before bed. We also try to eat as healthy as possible, and are outside and active as much as we possibly can be. We try to be good roll models for our children, which is so very important if you want your children to be healthy and active as well. Practice what you Preach. Marji, I do the same – offer my son a good variety of wholesome foods, require him to sit at the table to eat but not to finish all of it, and assume he will eat what his body wants. Interestingly, he prefers really strong flavors (he regularly eats a dish of raw onion or a head of roasted garlic) and he likes making cookies better than eating them. He’s 2.5. I don’t worry, his growth is good and he’s eating to live. We don’t keep refined grains or sweeteners or processed foods in the house and don’t have a television to feed him sugar commercials – I never thought of that as a nutrition thing. offered, but usually needs coaxing to eat a very meaty meal. Unless he doesn’t. I don’t worry because my son is grown and slender. If people have younger children and are worried about their weight, their energy is better spent by educating themselves on healthy eating and exercise, so that they can lead by example. Of course I am concerned. The biggest problem is the school lunch menu. I work in the same district, but at the high school level there is always fresh veggies and fruits to select from. The main course is always high in carbs/fat. They say they bake everything but calories are still involved. Her dad and I are both rather heavy. We all work out. She and her dad ride bikes a few times a week to the tune of 15-20 miles a day. This helps to get the school weight off. She loves her food like both of her parents. She use to eat a ton of veggies and fruits but is made fun of at school when she packs her lunch. She no longer wants to bring cherry tomatoes, cucumber slices…she want the packaged materials other kids bring to school. Her friends have influenced her choices massively. Hopefully over the summer we can get her back. We’ve all cut back..I need to read what you have done. Our daughter is 9.
by the way at the high school I teach at, I’m shocked by the weight of the kids. It’s amazing. There were never that many “muffin tops” around where I grew up. Even 10 years ago, kids overall were not that heavy. Could it be the gallons of soda, coffee drinks, potato chips etc? Rebecca, school lunches are generally horrible. And you’re definitely not the first person I’ve heard from whose kids want to eat the same things their friends are eating. Maybe I just got lucky and happened to start talking about this stuff before our kids started eating with other kids, but they both love their meat and veggies and think McDonalds is only for when you’re on a road trip and don’t have time to pull off the turnpike for something good. Oh, and yes, it’s the gallons of soda and coffee drinks. If you cut those out you could probably even keep the chips and still drop plenty of weight. My kids are all active, and good eaters, and in good shape. Yes, they get junk food sometimes (2 are teenagers, one of whom is in college–need I say more) but they enjoy and appreciate good food too. I think that the more a parent plays “Food Police” the more kids will rebel and be sneaky. Barb, that’s the hard line to walk. You want to give them good advice, but don’t want to provide something to rebel against. Teaching by example still seems to be the best bet, which means eating meals with your kids, and feeding them the same thing you’re eating. If you watch this and still think there isn’t a problem, then you are contributing to the problem. He’s an endocrinologist who works with obese kids in CA. This guy has been published in the top scientific journals (not just medical), and is SPOT-ON in everything he says. It’s an hour and a half long but could save your life. Watching this might be the best hour and a half I have spent in my life. My son was diagnosed with Type 1 Diabetes (hereditary, not related to diet) when he was 5, he is 18 now. My daughter is 23 and living on her own. Right from the start I have not allowed ‘junk food’ in my house with the exception of the occasional treat, and most of the time the treats were homemade by me. I have always emphasized and encouraged them to eat healthy, whole foods, not processed fake food. Although I tried to strongly encourage them over the years to eat their veggies, I have never been militant about it. I knew they would get their nutrients in other ways if they were eating healthy in general. And I have never worried about amounts either. As long as they were eating something that was good for them, I let them eat until they were satisfied. My son is naturally skinny, and the diabetes is a factor in that too. Up until my daughter became a teen she did not have weight issues but once she got away from home and started hanging around friends who ate fast food, it was hard to keep her away from it. Today, she does struggle with her weight but she has started to come around and is going back to the basics that I brought her up on. Now at the age of 18, my son knows that if he wants a snack he can reach for fruit, yogurt, unbuttered popcorn, or an all natural pb sandwich on whole grain bread, and as long as his hunger is satisfied, he is happy. Karen, I just did an interview with a guy who has Type 1 Diabetes, is an endurance athlete, and eats a paleo diet — meaning no grains or processed foods. I’ll be pulling out some quotes to share with guests over the next few days, but if you want to see what he has to say now you can go here and follow the links at the bottom to sign up for a membership. Oh, and I forgot to ask: Why no butter on the popcorn? The butter isn’t the problem there. Depends on who you ask. People who eat strict paleo won’t eat it because it’s a grain. Strict low-carbers avoid it because corn is starchy and high in carbs. Personally I eat popcorn, but generally not during the week. (For me it’s about the carbs.) My point was that most people who avoid popcorn do so because of the fat in the oil it’s cooked in or the butter you put on it, which is completely backwards. As long as you’re using real butter and not some frankenfood “butter-flavored topping”, of course. Actually I have no problem with butter, as long as it is real butter. So I buy the unbuttered popcorn and let him add real butter if he wants it, rather than the buy the ‘butter flavour’ popcorn, which is mostly chemicals. I don’t worry nearly as much anymore. We watched the documentary “Fat Head” as a family (all five of us, kids 13, 11, 9). Then we eliminated all grains, sugars, and “modern” fats. Everyone on board. This was in April. Since then the 3 of us with extra pounds have lost weight, our digestive issues have greatly improved, and our energy is great. I know this post was meant for parents but I’m a 20 year old and newly engaged. 🙂 I was raised eating healthy non-packaged foods and home cooked meals with the occasional “treat”. However, my fiance’s family is definitely more “mainstream American” when it comes to cooking and eating. For example one of his favorite dishes that his mother makes is INSTANT mashed potatoes. When he told me that I was floored. Anyways, he is pretty much on board for anything that I cook, but I’m worried about the influence his family, especially my soon to be MiL will have on our kids. Any advice on how to keep these habits out of our home? Kristina, I’ve got two things to try, and one that you should definitely not try. First, the bad idea. Don’t tell your kids they can’t eat what Grandma just gave them. The kids will cry, Grandma will be pissed off, it will become a big thing. Three years ago we were eating at a steak place. Our oldest, 8 at the time, got a baked potato with butter. She said something was wrong with the butter; it tasted greasy. We asked the waiter, who confirmed it was margarine. She asked if she could send the potato back and get fries instead. You can’t eat food you don’t like just because you think it’s good for you. You have to find good stuff that you also like to eat. Oh, PS: Congratulations on the engagement! My eldest son is only 2.5 years. I voted, wanting to teach good habits. I don’t really worry because he is active and eats almost anything you put in front of him. So I just try to balance. Although he already shows that penchant that most kids have for wanting the “wrong” things. It would be easier if I could give him milk products, but unfortunately with his intolerance he is limited in his “snacks”. I think people need to be more aware of HOW MUCH, sweets(read any refined carb) they may be feeding their children, without realizing. Balance is the name of the game. Was that 60 replies already? Holy Moley. Some were funny, some were outrageous and I am amazed at how quickly some people are ready to throw other people into the fat of the fire… Wierd phrase that. My two sons are different as night and day in their sizes but I think some of that is hereditary and some is how I ate while I was pregnant. When I was pregnant with 1st son, the thought was that I had gestational diabetes. I took a 1 hour glucose test and tested positive. So, I had training with a diabetes clinic and ate mostly veggies and meat and low sugar meals. With son number 2 I had also tested positive for the 1 hour test but they re-tested me on a 3 hour test and I was negative. So that’s where I went hog-wild eating all kinds of sugary treats I shouldn’t have. Mostly because I could. My first son is long and lanky and skinny looking like a string bean. My second son is long but slightly more curvy and still skinny. Keep in mind son 1 is 9 and son 2 is only 3, both are slated to grow very tall but son 2 looks to be getting longer quicker. I do worry as son 2 intentionally seeks out sugar, carbs, and avoids some meats but not all. When I present balanced meals, he always goes for the carb item first. For my own plate, I try to always eat my veggies first, and I am hoping that, if they see that, they will follow my example. Yes I worry. All three of my children are overweight. I have looked everywhere for ways to help them but the messages on the internet are so confusing. One thing says do this and another says don’t do that. They all like to eat a lot. My 16 year old has a car and a job. I come home from work and find her on the couch with a ton of food and so stuffed her shirt rides up. I tried to talk to her but she gets angry. I have always been healthy. Their father walked out five years ago so I can’t be at home as much as I would like to and I’m a single mom so I can’t afford a babysitter. The other two follow their sisters behavior and I worry they will end up severely obese and sick. You can’t make kids do what you want starting about the time they learn to walk. After that it’s all about teaching good lessons by example. With a teenage daughter who already gets angry when you talk about how she eats, I don’t think you really want to make food a battleground issue. That’s where eating disorders come from. Maybe you can start teaching the younger daughters to cook. At least if they know how to make good food, and they see how much better it can be, they’ll consider it an option. Good luck, and keep me updated. Except that yes, I do want to teach him good habits while he’s still young — and like Devan in the very first reply, I suspect eating too much carbohydrates as I grew up is what made me overweight, and carbohydrates seem to be precisely what my son likes best — so yes, I do worry after all. So much for being able to make one’s mind up. You just touched on the thing I worry about. Will my girls learn eating habits while they’re young and active that won’t work when they stop growing (taller) and aren’t so active any more? So maybe what we gotta teach ’em isn’t eating habits, but staying active? Actually, I don’t think level of activity matters as much as the fact that they stop growing (taller). I dropped 50 pounds without changing my level of activity at all. I’ve since started working out, and I really notice the difference when I climb 5 flights of stairs — quickly — and don’t get winded. But the weight is almost all about what I eat. My children both fall in 80th percentile. I was heavier as a kid and always remember feeling bad about myself. I work in the health and wellness industry and feel I am very healthy and am in the best shape of my life. However I will never forget the hurtful words of my peers when I was a kid. I think my kids weight are average to maybe heading towards heavy and yet are pretty picky eaters. I want to add that no, you don’t feed every emotion with food, yet I have also heard that a possible cause for that whiney or disagreeable attitude could be low blood sugar. Kids get so busy sometimes they forget to eat, drink, or even go to the bathroom! Our girls mostly do the same. They do like their candy every now and then, but they treat McDonalds as a punishment, not a treat. 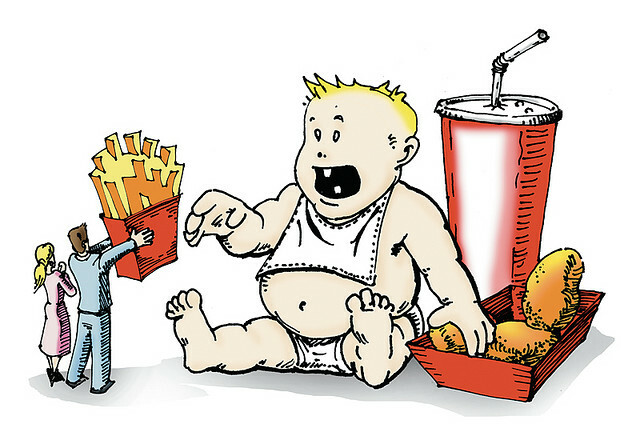 I worry about them when they are young, as someone studying nutrition it has been shown that if they come to like sweet food when they are young they will keep making these bad food choices when they are older which is a contributing cause of obesity. Once in a while is ok but sugary foods regularly or using them as a reward is a sure start for setting them up for life long food choices. Hi Drew – I am really enjoying your website. I was brought up learning to cook real food, but also a lot of junk. A small background – brought up around US Air Force bases by an American Dad with a whole family of obese and diabetic relatives on his side, and a titchy British mum who was the only thin person in her family of chubs. Put on my first diet at the age of 10 by the base hospital, even though when I look at pictures, I had a bit of puppy fat, but not fat. 1200 calories a day for a 10 year old! Fast forward, I am now 47, morbidly obese but trying desperately to change things. I married a man who is a bit tubby, but not as fat as me. I have a ten year old daughter who is a stick insect, and a three year old son, who is built like a linebacker, but with no excess fat on his body. Thank God! I have brought up my children with only occasional sweet treats. When I bake, I use a lot of whole wheat flour, all from scratch. no hidden nasties. This also saves me a lot of money. My children love vegetables, wholemeal bread, but would live on chips and junk if I let them. All kids would – they are hardwired that way. But I started from their infancy to gradually lead them to a sensible way of eating. My husband is the same, his parents were would-be hippies, and he grew up as a vegetarian although as soon as he got away from his parents he started on the meat with relish! When my 10 year old daughter wants a snack, she is just as likely to ask for a carrot or some celery as she is sweets, because she knows that I am more likely to acquiesce if she asks for veg or a sandwich rather than sweets. Sweets are allowed as a treat or occasional indulgence, not banned completely, and so are appreciated when they are allowed. People will disagree with me I am sure, but if you train your children, but allow them a small indulgence now and again, they are more likely to appreciate a healthy diet when they are older. We occasionally have junk food, but not even once a month, or a trip to MacDonalds when we are on a road trip, or such, but again, a rare indulgence. Sorry if this is a bit rambling. I do enjoy your website very much. We’ve been training the kids for years. We actually use a trip to McDonalds as a threat. We just hope they don’t decide to rebel (too much) when they’re older. I do not believe weight is a problem. I believe each person has a natural weight range that is healthy and normal for them, and that there is much more variation in that range between individuals than in the “normal” range determined by the health industry these days. I believe if a person has a healthy relationship with food and exercise, then that person will be in his or her healthy weight range, even if that means they are “overweight” or even “obese”. Weight is not a substitute for health. I wish I could reply to one of the comments above about the obese athlete: what is the problem? He was obviously quite fit, and not just “under all his fat.” Fat is not a suit a person wears; it’s that person’s body. You don’t say anything about his eating habits. Certainly, if his diet was poor, improving it would improve his health, but not necessarily make him lose weight. It seems most people are over complicating this. Children are just that, children. The rely on us their parents to feed them. We all know what is good food and what is bad. We need to stop worrying about how much they weight. But worrying about what they are eating. Its not about weight but about health. I learned that i make whole grains ( like Daves killer bread, ezkiel, kids cliff and bobs red mill) and healthy choices ( natural starches) as my extremely picky 4 yr old only option for carbs. If he doesnt eat it then fine, but i’m no longer giving my boy garbage ( fries, chicken nuggets, corn dogs) because i’m worried that hes not eating enough. Kids Will eventually get hungry enough to eat the healthy choices your giving them. I personally believe the biggest cause of childhood issues is Parents need to accept that we can be the bad guy ( and should be) for the betterment and safety of our children! First, I agree that parent should be willing to be the bad guy. But the thing is, my kids like the good food I give them. Sure, they still like the junk they get at school or at friends’ houses, but I’m not sitting there forcing them to eat their broccoli. Too many parents, I think, sabotage themselves by acting like healthy food is a chore for their kids to get through. The kids pick up on that. I don’t have children of my own yet, as I’m only 15. But this is an interesting topic. I think it’s fine if you don’t make it about weight or body size with the kid, but instead focusing on THE WHOLE FAMILY making healthy choices about food and exercise. But I have it from a different perspective. Because I was in a quite unhealthy house hold until a couple of years ago. My mom was one of those lucky people who could eat anything and not gain weight (Until her thyroid gave out, hence my household now being healthy). I unfortunately, have my dad’s metabolism and I was an overweight child. I wasn’t obese, but I was overweight. I was put on a diet (not about calories, but it was still a diet and weight was being focused on) and I had some confidence issues because of it. I remember a few times when this diet (which involved writing down everything I ate and all of my physical activity) made me cry. I was still quite happy though and not terribly self concious until I turned 13 (even though I had been called fat at 12, I was happy with what I thought was “curves”.. really love handles, which my mom informed me of also when I was 12 I think). When I was 13, a change in environment (elementary school to high school), my mother constantly talking about calories, trying to lose weight, and body shaming, and this background (there’s a lot more I haven’t mentioned) was perfect breeding grounds for an eating disorder. And I developed one, which I am still struggling with. I also started cutting because of the amount of hatred I had for myself, and I’m still struggling with that as well. So summary of it it, it depends on how you approach it. I believe that mine was approached in the wrong way, even though my mom wasn’t trying to be detrimental to me. I can still remember the weight I was at the start of the diet: 112 pounds.. I was supposed to be 80 pounds. I wish every parent could read this. I’ve heard 10-year-olds with thighs the size of my wrists talking about calories, and I know they’re hearing it at home. I talk about food a lot, but almost never mention calories or dieting. I avoid carbs but eat plenty of meat and veggies, so the girls see that you don’t have to starve to eat and be healthy. One anonymous stranger on the internet can’t make up for what you heard at home growing up, but I promise you it gets better. The urge you have to exert control over yourself can be channeled into more productive things. Instead of cutting you can exercise. Forget about weight and try to get strong. Pissed off and want to cause some pain? Do pushups until your arms shake. Depressed and want to feel something other than sad? Do squats until you can barely breathe. You can’t just will yourself not to have the urges you have. But you can redirect them into something useful. Good luck, and please report back every once in a while. No I don’t worry, my boys are lean, healthy and active except for the one who sits at a computer all day. However, he is the scrawniest of my teenagers. We do eat mostly homemade or homegrown food and I am sure that helps. I tell people all the time that what you eat is the most important factor in your weight, by such a large margin that doing it wrong makes every other right thing you do meaningless. Bodybuilders have a saying: You can’t out-train a bad diet.